The Emerson Avenger: The Unitarian Universalist Association Of Congregations Lost HOW Many UUA Congregations In 2013?!! The Unitarian Universalist Association Of Congregations Lost HOW Many UUA Congregations In 2013?!! 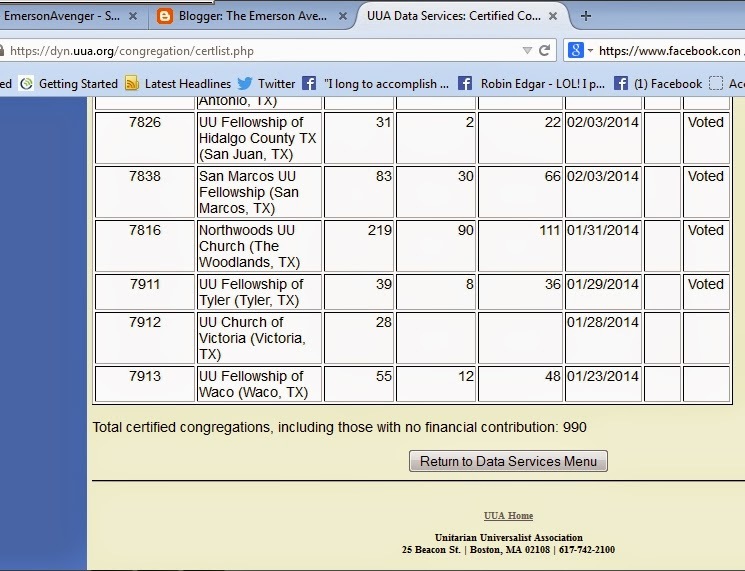 If we accept the Unitarian Universalist Association's own UUA Data Services department's current list of Non-Certified Congregations as being reasonably up-to-date and accurate, there are no less than 53 UUA congregations that have not certified their UUA membership more than three months after the February 3rd 2014 deadline for doing so, and less than one month away from the 2014 UUA GA in Providence Rhode Island. In that these Data Services figures have in fact been recently updated (within the last two weeks), I have reasonable grounds to believe that the Peter Morales UUA administration is having some difficulty in persuading 50 or so UUA congregations to re-certify their membership in the Unitarian Universalist Association of Congregations. If I remember correctly, and I am pretty sure that I do. . . The central claim of Rev. Peter Morales' platform for being elected as the first token Latino President of the Unitarian Universalist Association of Congregations was that he was going to "grow" Unitarian Universalism from what he himself described as "a tiny, declining, fringe religion" in his own "stump speech" announcing his candidacy for UUA President, into "THE religion for OUR time." In fact, Rev. Morales' "less than humble" campaign slogan was, "We CAN be THE religion for OUR time." Six years into his de facto 8 year term as UUA President, Rev. Morales has not only FAILed miserably in growing Unitarian Universalism in America, but The U*U Movement aka THE Tiny Declining Fringe Religion™ is quite evidently in steady and ongoing decline. "The UUA's latest membership figures count 154,707 members in 1,024 congregations in the United States, a decline of 1.2 percent from last year. Another 3,479 members belong to 23 congregations in other countries, for a total of 158,186 members in 1,047 congregations worldwide. Children's religious education enrollment dropped 4.6 percent last year in the U.S., to 49,191." How is it possible that the UUA's "latest membership figures" could "count 154,707 members in 1,024 congregations in the United States" when, at the time that claim was made in late March of 2014, even fewer than 990 UUA congregations worldwide had actually recertified their membership in the UUA? 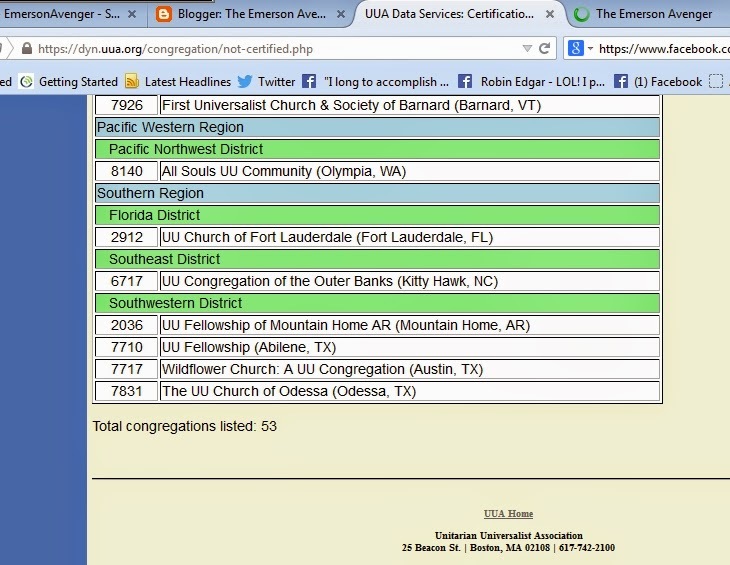 How can the UUA truthfully claim that "another 3,479 members belong to 23 congregations in other countries, for a total of 158,186 members in 1,047 congregations worldwide" when it's Data Services data shows that no less than 13 of those "International District" have not yet re-certified their membership in the UUA? 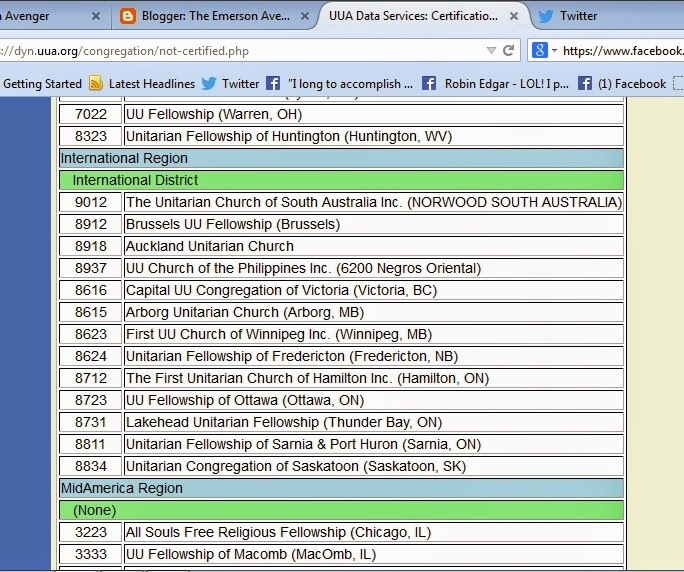 Even if one adds ALL of the 53 currently NOT certified congregations to the 990 certified congregations listed by UUA Data Services, the total number of UUA congregations would be 143, not 147 as claimed in this dubious UU World article that misrepresents and conceals the readily verifiable Truth from Unitarian Universalists. The fact remains however that there is a very real possibility, even a high probability, that at least some of those 53 non certified congregations will not re-certify their membership in the UUA. What happened to those 4 UUA congregations that magically disappeared into thin air? I expect that they no longer exist at all. . .